France wins the 2018 World Cup while hybrid pitch takes second place! Soccer fans were treated to yet another memorable World Cup this year. The team and customers of Watersavers Turf really enjoyed watching all the matches at all our SF Bay Area locations. We’ve also enjoyed telling people about the hybrid pitch at the World Cup. Made of 95% real turf and 5% artificial grass, this hybrid pitch for World Cup arenas offered many of the same benefits as our sport turf products. 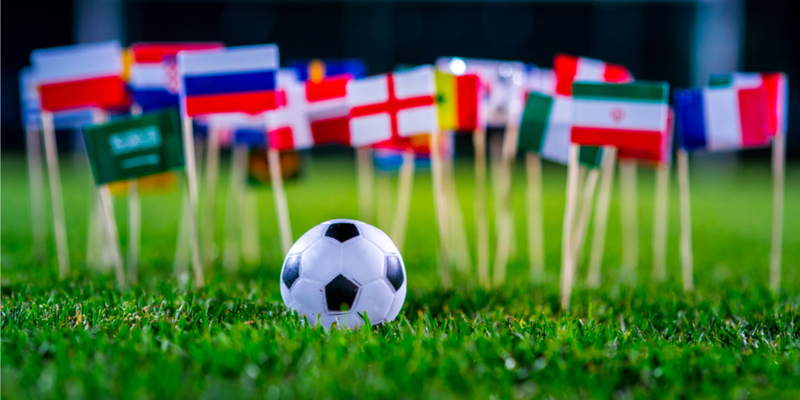 The games may be over now, but we’re looking forward to seeing if teams embrace artificial grass products as they did at the World Cup in 2018. A blend of natural and artificial grass for soccer fields is an ideal surface for many reasons. The reinforcement system on this type of pitch keeps the field in good shape throughout game play. This blend of natural and artificial grass for soccer fields also drains water more quickly than live grass alone. That makes it easy for players to avoid injury. England worked hard for the chance to win the team’s first World Cup since 1966. They kept the score tied long enough to the match to go into extra time. The game ended in defeat for the English players when Croatian player Mario Mandzukic scored the winning goal in the 109th minute. This ended one of the more thrilling runs in this year’s matches. Many didn’t even expect England to reach the semi-finals. The team may not have won, but the players put in a big effort to make it as far as they did. England was also unable to achieve a win in the team’s playoff for third place against Belgium. To be fair, this has been the best effort Belgium has ever put into a World Cup. The English players clearly had their work cut out for them. Although they did not succeed in winning the match, they didn’t let their defeat at the hands of Croatia stop them from playing extremely well. Some commentators even say that, while the outcome may not seem to reflect this, England played more consistently during this match than they did during the match against Croatia. Croatia impressed fans on their way to the final match of the World Cup. That said, the team was unable to secure the country’s first win. The champions this year were the French players. Along the way, they put on a show soccer fans won’t soon forget. For instance, 19-year-old Kylian Mbappe scored the first goal by a teenager in a final since 1958. There was also the “own goal” that landed in the Croatian net after Antoine Griezmann’s free kick skimmed Mario Mandzukic’s head and made its way past goalkeeper Danijel Subasic. The hard rain that fell during the victory ceremony wasn’t enough to keep smiles off the faces of the French players. Soccer fans in attendance and watching at home likely felt the same. In case it wasn’t clear, we’re pretty big soccer fans at Watersavers Turf. We also sell products designed specifically for soccer players. Our synthetic soccer turf is a perfect surface option for any team. We supply synthetic soccer turf to school districts and town rec departments, where both players and fans quickly learn about all the benefits it has to offer. Our synthetic soccer turf is perfect for budget-strapped districts and leagues because it doesn’t require the same amount of upkeep as live grass. It’s easy to save money when you never have to water or mow the field. Our turf also stays in great shape throughout a game. Live grass can get torn up easily during game play. This presents a danger to players. They’re much more likely to trip and fall if the surface doesn’t stay flat. With our products, that’s not an issue. Like the hybrid field mentioned earlier, this surface also drains water fairly quickly. Teams often find they have more chances to practice after they make the switch because rain doesn’t force them to cancel. Again, this feature also adds to player safety. The best way to understand why our field turf is ideal for your needs is to see it for yourself. Feel free to stop by and learn more! You’ll find field turf designed specifically for soccer fans when you visit any of our Watersavers Turf SF Bay Area locations. Along with field turf, you’ll also find supplies to install and maintain it. Our team will even offer free large 1’ x 1’ turf samples if you’re not sure which style is right for your project. Don’t worry if you’re not able to make it to our area; we also ship to any spot in the Continental United States. People who visited us during the World Cup got an added treat: the chance to win an authentic team jersey. Throughout the games, we gave raffle tickets to customers every time they spent $300. We’ll soon announce the winners now that the matches are over. Give us a call toll-free at 844-974-8873 if you have any questions. We’re also free to chat online. Of course, we hope you enjoyed watching the games as much as we did! The next World Cup may be a few years off, but you can be sure we’re looking forward to it.